After successful mating occurs, expect poults to hatch in approximately six weeks. The time line breaks down into roughly two weeks of laying one egg a day and 28 days of actually sitting on the nest. 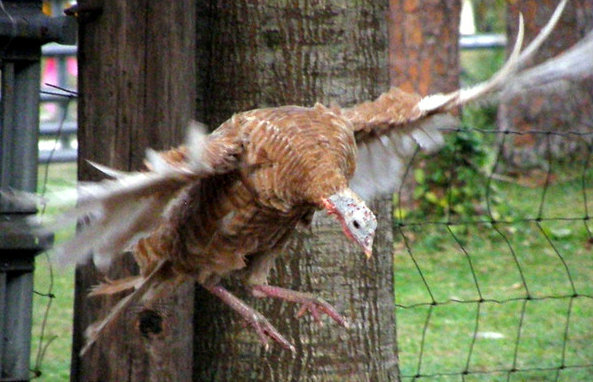 Once a suitable nest location if decided upon the turkey hen will lay 8-18 eggs, (12 average) Occasionally hens will double up at nests and lay up to 30 eggs. 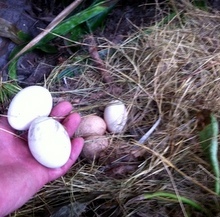 (when this happens I generally place some of the eggs in other hens’ nests. Oyster shell consumption: Shortly after the mating process, you may notice the turkey hen increasing her consumption of oyster shell if available or shell road material. This is normally a fairly good indication that she will begin looking for her new nest or perhaps even already begun laying eggs. The secretive stroll: The secretive stroll is conspicuous, because turkeys are social; their successful survival strategy is to flock together. 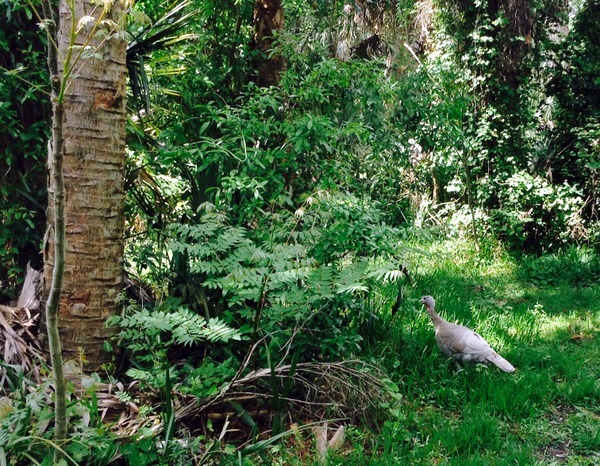 To spy a lone turkey is simply unusual. However soon after mating the hens will take a solitary walk, seeking their next nest location. The egg yelp: The egg yelp is the opposite of the secretive stroll. If the hen has yet not chosen her nest location, but she has to lay an egg, you will observe her walking the yard, and making what we term: “the egg yelp”, a sort of agitated, painful sounding loud yelp. During her hunt for a suitable nest location, she will continue to call the egg yelp while at the same time, searching in and out of weedy patches, fence lines, bases of trees and reviewing other possible hidden locations. Landscape shrubbery is fairly popular. As I type this, there are two hens walking the back yard yelping to find a suitable nest. However a uncertain hen might egg yelp on for hours-the hen may just drop the egg in the yard as she continues to search for her “perfect” nest location. Often, the hens will share nests. 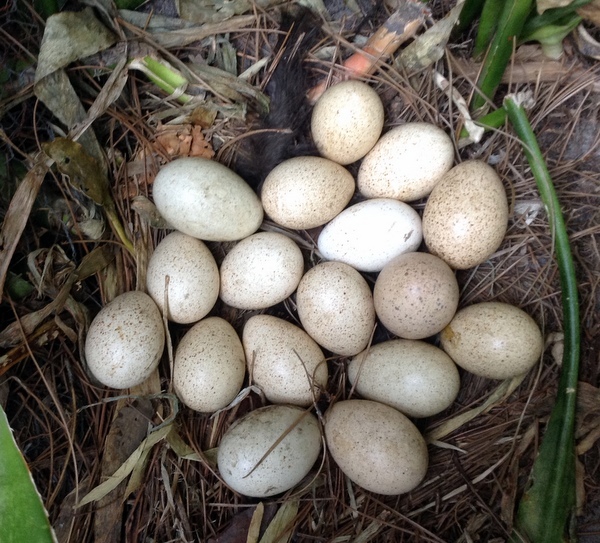 Sometimes one hen only drops an egg, but other times the second hen muscles her way into the nest location. 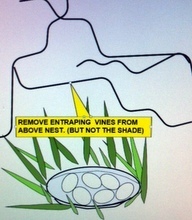 In the wild, the nest will generally be hidden in an open field of tall grass, the edge of a wood line and occasionally at the base of a tree. Another consideration for nest location: The back yard bird hen will search out a nest location away from the flock just so the other hens do not harass her. Preferred location: weedy fence line; with the base of a tree being their second choice. The edges of roads come in as a strong third choice. We have several Free Range hens that refuse to nest in the yard and hop or fly over our fences. They search out the weeds and briar growing along the outside of our fence property. 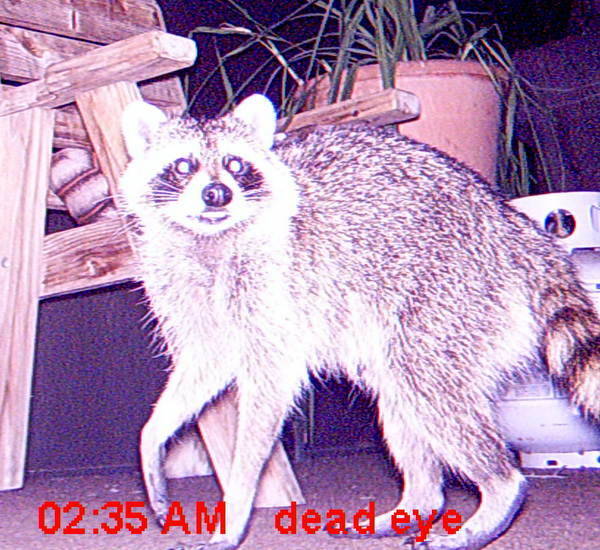 If an acceptable location is not found along the fence, they will strike off down the road. This is a overhead picture of our house. 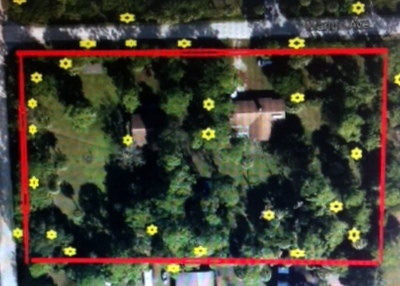 The Red line is the fence and yellow stars are where turkeys have nested. Note the pattern of fence-lines, shrubbery and bases of trees. 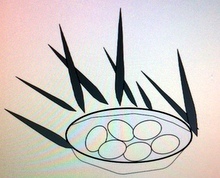 Use of fake eggs: Sometimes the hens can be persuaded to choose a location inside the fence by placing ceramic (fake) eggs in certain locations. Some inner instinct will often drive them to nest on other birds eggs. Normally the back yard hen WILL NOT use a nest box, unless she is caged. They are in fact very selective about where they place their nests. However I currently have five hens that insist on nesting in the chicken coop. Three prefer a large nest box built "turkey size" and two prefer making a nest on the ground under the chicken egg boxes. 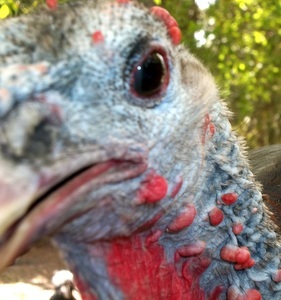 However most of the heritage turkeys prefer to find an outside nest: Our property is bordered by several wooded lots and the hens have a wide variety of nest locations to select from. 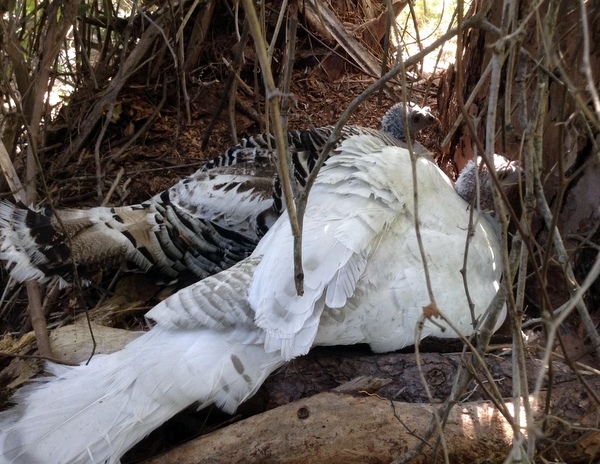 When we first got turkeys -we would search for hidden nests, the task seem rather daunting because even the white turkeys ability to fade into the background. 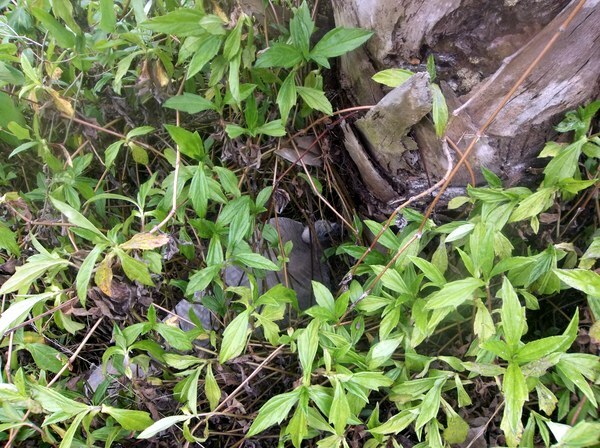 And the brown birds are nearly impossible to find. However, as the birds are “driven by an ancient selection instinct” they rarely build their nests further than 6 feet from the edge of the road or field. Knowing the 6’ limit is an incredible time saver in searching out hidden nests. A concept I keep in mind when hunting for a turkey nest: is that every wild turkey nest that I have accidently found have been in an open field of tall grass. --"My guess" is that a hundred thousand (or so) generations have nested in the open field where the hen could escape if needed, while perhaps the hens that preferred to nest in the forest were subject to predators. Whatever the reason: When searching for your hens' secret nest, you normally need only to check "edges"
After the nest location has been chosen, the hen will make daily trips to the nest. If you try to follow the hen to her nest, you will notice that she will walk in wide circles on the way to her nest, grazing and looking about- sometimes taking up to an hour to make her way to her eggs. So the turkey hen does not have a "turkey training nest class" she can attend, and so using pure instinct, she scrapes out a shallow depression & sometimes the nest (hole) is too deep. Hint: when the hen is off nest to eat and dust bathe, I sneak into the nest, set the eggs aside and fill in the concavity. 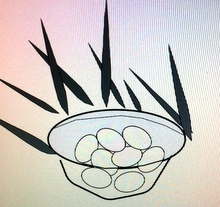 Then place the eggs back on the nest. When the eggs begin to peep, I try to get access to the eggs and point the wide end out, so the poults can slip from their eggs with minimum impediment. Tree Roots at the bottom of the nest can kill poults: There is a preference for the birds to place their nests at the base of trees. 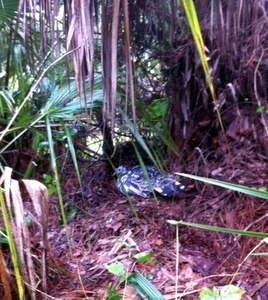 Consequently when the nests are scratched out, there could be large roots routed through the nest. 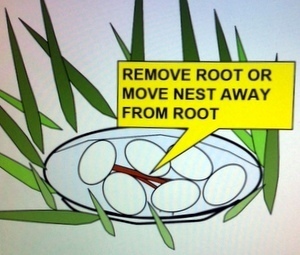 The problem with roots….When the eggs peep “baby turkeys beginning their process of escape” the root could cause a pressure point that damages the integrity and strength of the egg. Occasionally a weakened egg is pressed between the tree root and the hen, crushing the egg only a few days before the poult is ready to emerge. Hint: when the hen is off nest to eat and dust bathe, I sneak into the nest and fill in around the root with dirt or pine needles. But more often, I actually have to scrape out a new location adjacent to the original nest, making sure there are no roots in the new location and shift the eggs to the new location. 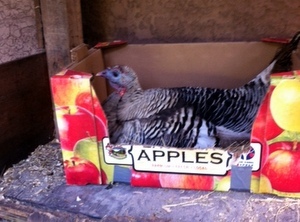 When the hen returns, she never notices that her nest has been shifted a little. 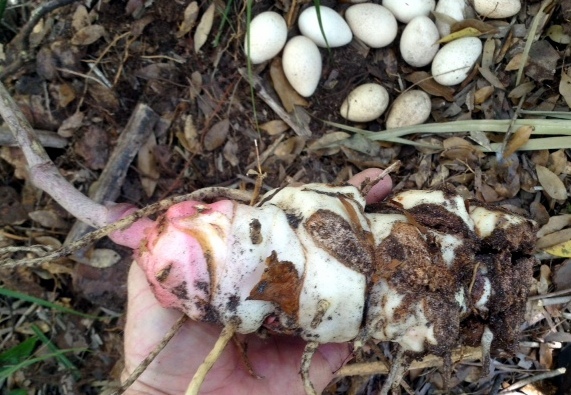 Dug this root from under the nest, Welcome to Florida! Grape vines and briars. 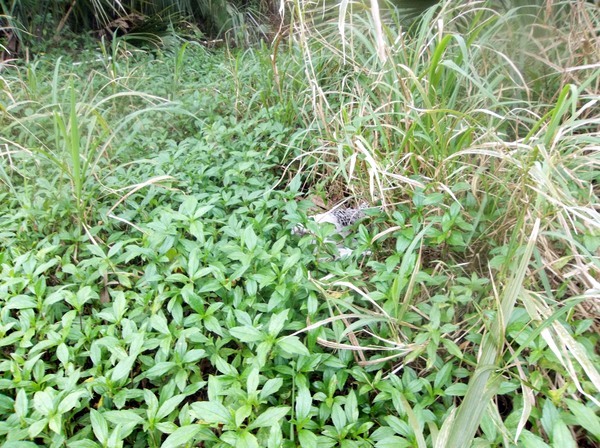 The turkey hen will sometimes nest in an open weedy location, however other times the nest will be situated in a thicket or briar. 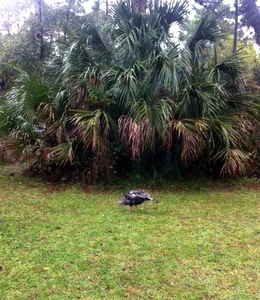 After I locate the backyard turkey’s nest, I will evaluate it. Is it hidden enough? Should I add cover? Shade? Or is the nest in a “too thick” of a location? Will the bird get trapped in the surrounding vines and briars if jumped by a bobcat? There is a difficult decision, cut away some of the surrounding vines to create an escape route or perhaps erect a temporary fence? Also their vines or branches inhibiting the bird’s comfort? Often, I have to use clippers and trim vines out of the way simply for the birds comfort. 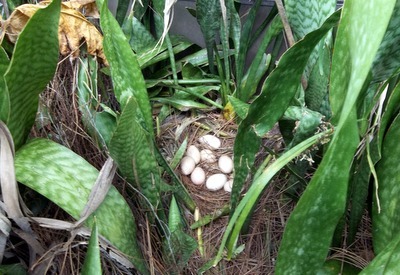 Couple of final thoughts: Here in Florida, we have palmetto leaves that can be added to the top of the nest to create a mini rain or sun shelter---will a palmetto leaf help? So begins the most dangerous period for mother, egg and chick alike. For the hen, as for the thousand generations before her, she has temporarily forsaken the safety of the high branches for the gamble of motherhood and nearly a month of hiding in tall grasses or shrubbery.